Dakak Golf Club on Friday formally announced the launch of its breathtaking new golf course inside Dakak Resort. 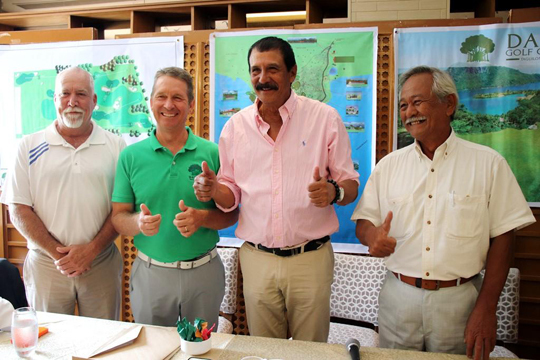 Former PGA Tour campaigner Rick Gibson (second from left) joins fellow officials (from right) Club Manager Mark Gaston, Club president Cesar Jalosjos and Senior Designer John Cope during the formal launching of the newest golfing paradise in the South – the Dakak Gold and Country Club – inside the famous Dakak Beach Resorts in Zamboanga. Dakak Golf Chairman Cesar Jalosjos and Dakak Golf President Rick Gibson led officials in the formal launching during a media conference at the Manila Hotel. “We are very pleased with the results of the development,” said Jalosjos, who has been overseeing the project. “It will be an unforgettable experience to play there." The front nine of the Greg Norman-designed course is already open for play, and the grass is already being laid down on the back half of the course. Dakak Golf course will be fully operational by November. There are three par 3’s, three par 4’s and three par 5’s on each nine, and every hole has its challenges. Seven of the first nine holes face the Sulu Sea, a feature unique to Dakak. Many of the holes require a golfer’s shot to go over water, with one needing a near-perfect tee-off over a waterfall to get onto the green. The entire property is a seamless blend of blue and green, with almost no man-made structures in sight. Luckily for Dakak, all the needed materials for completion are right on site, with the grass for the course being specially grown nearby.